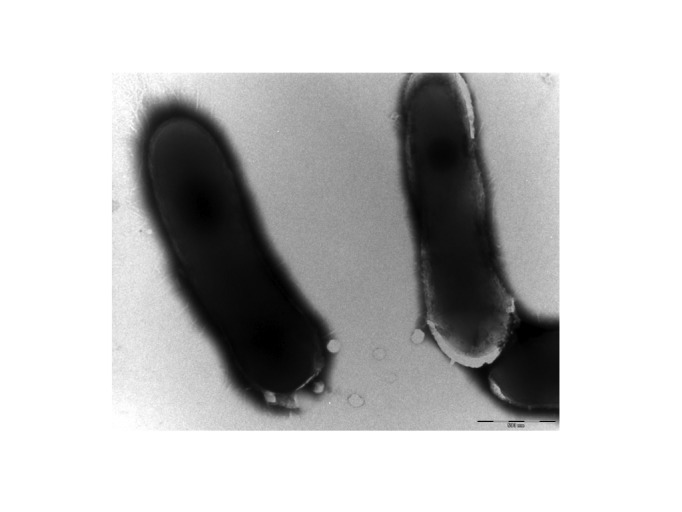 Corynebacterium timonense strain 5401744T(CSUR P20T=CIP 109424T= CCUG 53856T) is the type strain of C. timonense. This bacterium was isolated from the blood of a patient with endocarditis . The genus Corynebacterium is comprised of Gram-positive facultatively anaerobic bacteria with a high G+C content. It currently contains over 80 members . The combination of chemotaxonomic markers [3,4] and a molecular approach based on 16S rRNA and rpoB gene sequence analyses improved the identification of members of this genus [5-7]. Corynebacterium species have been isolated from human clinical sources [8-14], animal sources [15-18] and the environment [19-21]. 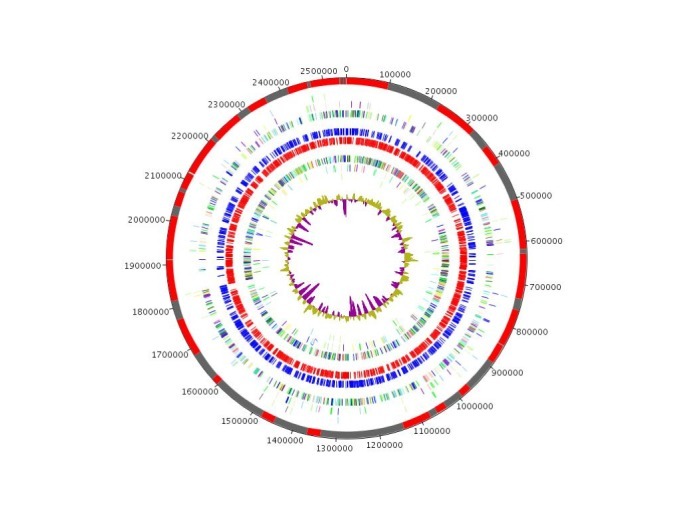 The 16S rRNA gene sequence of C. timonense strain 5401744T was compared with sequences deposited in the Genbank database, confirming the initial taxonomic classification. 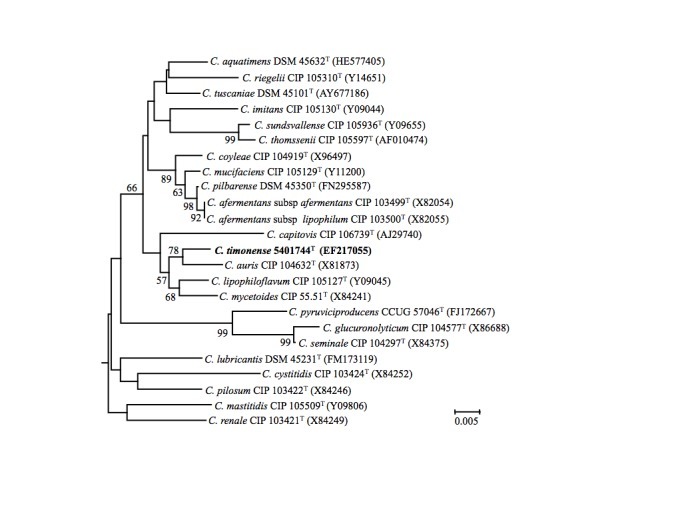 Figure 1 shows the phylogenetic neighborhood of C. timonense in a 16S rRNA based tree. The bacterium was first characterized in July 2005, in a 56-year-old man with a history of infective endocarditis. It was isolated from blood culture in the Timone Hospital microbiology laboratory. Cells are rod-shaped that occur as single cells, in pairs or in small clusters, 0.6-2.1 µm long and 0.4-0.6 µm wide. Optimal growth of strain 5401744T occurs at 37°C with range for growth between 25 and 50 °C. After 24 hours growth on blood sheep agar at 37°C, surface colonies are circular, yellow colored, glistening and up to 1-2 mm in diameter. Carbon sources utilized include glucose and ribose. Activities of catalase, pyrazinamidase, alkaline phosphatase, esterase (C4), esterase lipase (C8), lipase (C14), leucine arylamidase and acid phosphatase are detected. The fatty acid profile is characterized by the predominance of C18:1 ω9c (36.4%), C17:1 ω9c (27.1%), C16:0 (10.9%) and C18:0 (6.1%). Tuberculostearic acid is not detected. The size and ultrastructure of cells were determined by negative staining transmission electron microscopy. The rods were 0.6-2.1 μm long and 0.4-0.6 μm wide (Figure 2). Table 1 presents the classification and features of the organism. C. timonense strain 5401744T, was grown aerobically on 5% sheep blood-enriched Columbia agar at 37°C. Five petri dishes were spread and colonies scraped and resuspended in 3 ml of TE buffer. Three hundred μl of 10% SDS and 150 μl of proteinase K were then added and incubation was performed over-night at 56°C. The DNA was then extracted using the phenol/chloroform method. The yield and the concentration was measured by the Quant-it Picogreen kit (Invitrogen) on the Genios Tecan fluorometer at 182 ng/µl. Shotgun and 3-kb paired-end sequencing strategies were performed. The shotgun library was constructed with 500 ng of DNA with the GS Rapid library Prep kit (Roche). For the paired-end sequencing, 5 µg of DNA was mechanically fragmented on a Hydroshear device (Digilab) with an enrichment size at 3-4 kb. The DNA fragmentation was visualized using the 2100 BioAnalyzer (Agilent) on a DNA labchip 7500 with an optimal size of 3.5 kb. The library was constructed according to the 454 GS FLX Titanium paired-end protocol. Circularization and nebulization were performed and generated a pattern with an optimal size of 501 bp. After PCR amplification through 15 cycles followed by double size selection, the single stranded paired-end library was then quantified using the Genios fluorometer (Tecan) at 2,540 pg/µL. The library concentration equivalence was calculated as 9.30E+09 molecules/µL. The library was stored at -20°C until further use. The genome is 2,553,575 bp long with a 66.85% GC content (Table 3, Figure 3). Of the 2,456 predicted genes, 2,401 were protein-coding genes, and 55 were RNAs. A total of 1,779 genes (74.09%) were assigned a putative function,and 116 genes were identified as ORFans (4,83%). The remaining genes were annotated as hypothetical proteins (369 genes (15,37%)). The remaining genes were annotated as either hypothetical proteins or proteins of unknown functions. The distribution of genes into COGs functional categories is presented in Table 4. The properties and the statistics of the genome are summarized in Tables 3 and 4. To date, 13 genome of species belonging to the genus Corynebacterium were sequenced. The size of the whole genome was between 2.32 Mb and 3.43 Mb (Table 5). The gene number was correlated with the genome size and was between 2,187 and 3,131. The G+C content of the genome was less than 60% for C. diphteriae, C. glutamicum, C. kroppenstedtii, C. pseudotuberculosis, C. resistens and C. ulcerans but was more than 60% for C. aurimucosum, C. efficiens, C. genitalium, C. halotolerans, C. jeikeium, C. timonense, C. urealyticum and C. variabile. C. timonense shared a mean sequence similarity of 72.05% (60-99.01%), 72.15% (60.09-97.54%), 74.63% (60-98.37%), 71.83% (60-98.85%), 72.34% (60-98.02%) and 71.70% (60-97.03%) with C. diphteriae, C. efficiens, C. genitalium, C. glutamicum, C. jeikeium and C. urealyticum, respectively. Prophage Finder  and PHAST  were used to identify potential proviruses in C. timonense strain 5401744T genome. The bacteria contains at least one genetic element of around 40.3 kb (with a GC content of 64.9%), we named CT1, on contigs 6-7. A total of 53 open reading frames (ORFs) were recovered from CT1, that were longer than 55 amino acids and most of them (44) encode proteins sharing a high identity with proteins found in Actinomycetales order viruses. The preliminary annotation of CT1 was performed and the majority of the putative genes (41) encode hypothetical proteins. The ORFs with an attributed function (12) encode proteins involved in DNA packaging, cell lysis, tail structural components and assembly, head structural components and assembly, lysogeny control, DNA replication, recombination and modification. 47 of the ORFs are located on one strand and 6 on the opposite strand. The authors thank Mr. Julien Paganini at Xegen Company (Web Site) for automating the genomic annotation process and Laetitia Pizzo for her technical assistance. Garrity GM, Holt JG. The Road Map to the Manual. In: Garrity GM, Boone DR, Castenholz RW (eds), Bergey's Manual of Systematic Bacteriology, Second Edition, Volume 1, Springer, New York, 2001, p.119-169.